Why Sharpen a Lawn Mower Blade? A sharp blade is necessary for producing a well cut lawn, and learning how to sharpen your own lawn mower blades can be a great benefit to the homeowner. The task of lawn mower blade sharpening takes only a few minutes with the right tools and is not difficult at all, while loading the mower into a truck and taking it to someone else to sharpen can be a real pain and take several days. A dull blade will not cut well - grass and weeds tend to simply bend over in front of the blade instead of being cut off. 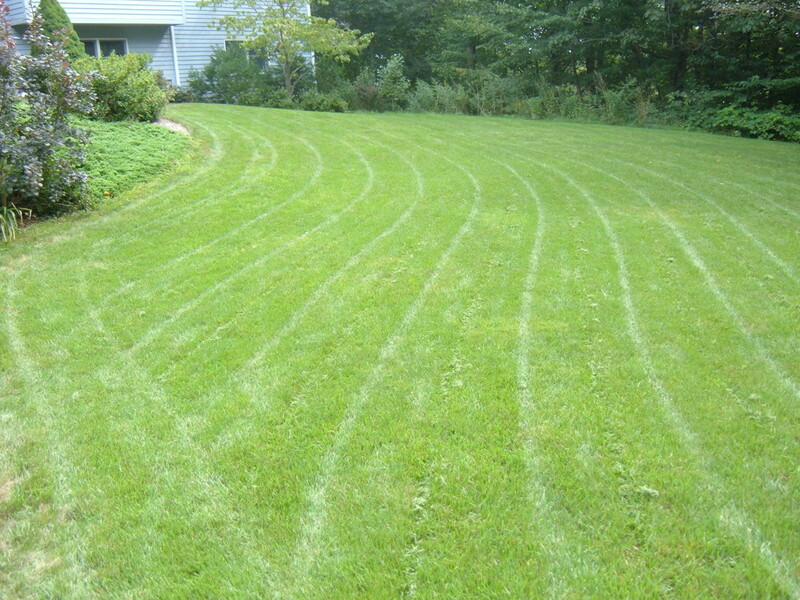 This results in a lawn with streaks of uncut grass in it as well as additional weed growth as weeds now have a chance to grow to the seed bearing stage instead of being cut short. 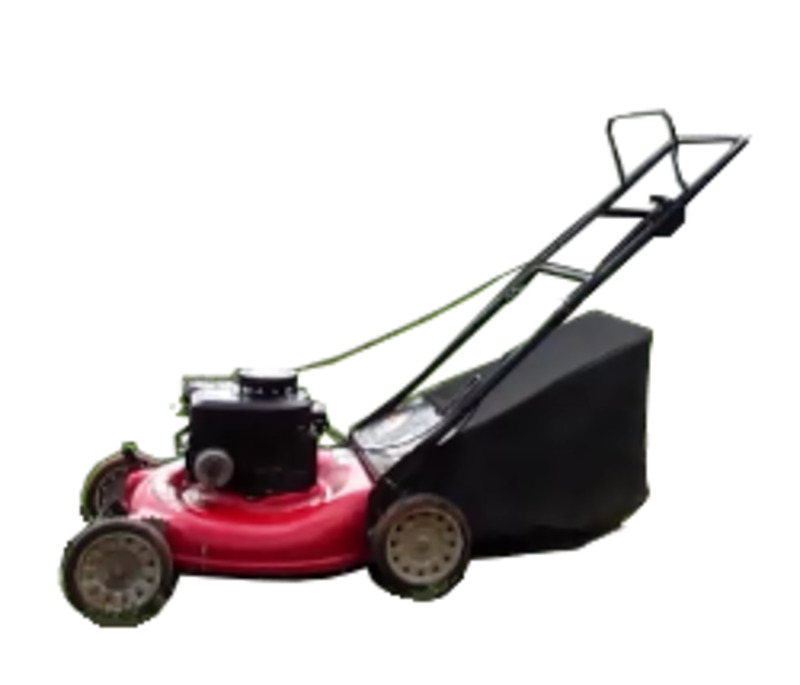 Keeping a sharp lawn mower blade will make the job of mowing the lawn easier and produce a better looking lawn as well. Before the sharpening process can begin the blade must be removed from the lawnmower. A wrench will be necessary, or possibly two wrenches or a ratchet and socket with one wrench. Be sure that you have the right size wrenches or sockets - it is easy to grab a metric wrench that is nearly the right size only to find that it slips on the bolt and rounds the corners off. Wrenches and sockets should fit quite snugly over the bolt, to the point that a coating of grass clippings or dirt on the bolt may prevent it from going on at all. 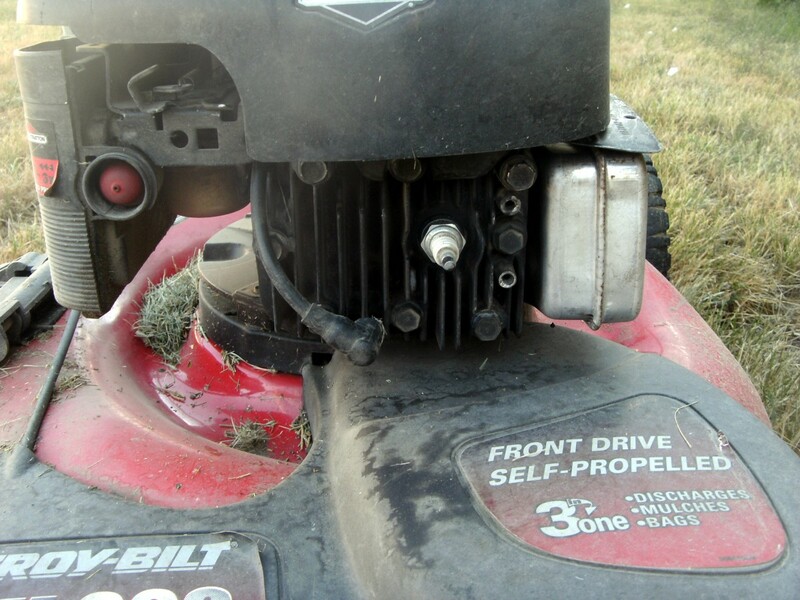 Drain the gas or run the mower until the gas tank is empty - you don't want gas flowing from the tank into the engine or leaking out all over the mower. Pull the spark plug wire before attempting to take the blade off as the engine will probably rotate a little during the operation and could start. The spark plug is a small, usually white, item protruding from the front or side of the engine and has a wire attached to the end of it - simply pull the wire off of the plug and bend it aside. It is not a bad idea to completely remove the spark plug as a safety measure, but if there is no chance the wire can again come into contact with the plug the engine will not run. 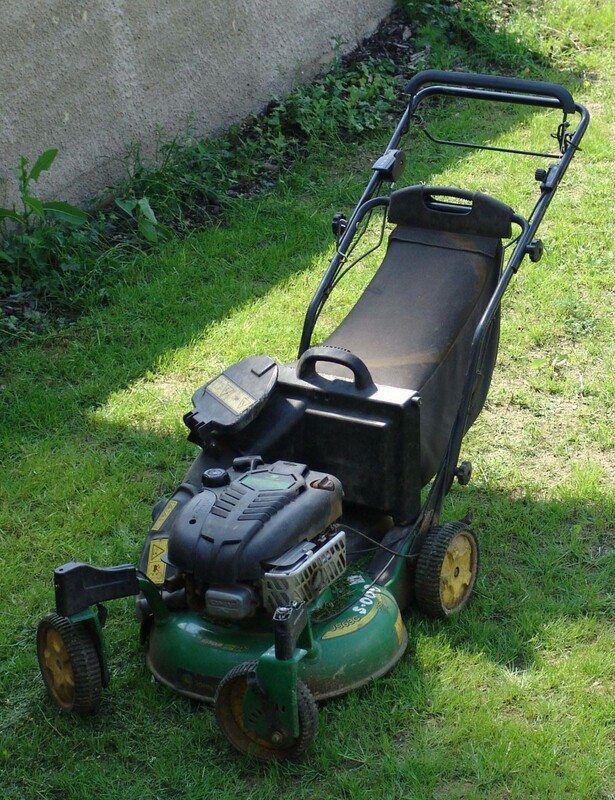 Turn the lawn mower onto its side or, in the case of a riding mower, raise it onto blocks or other supporting material so that you can get to the blades underneath. 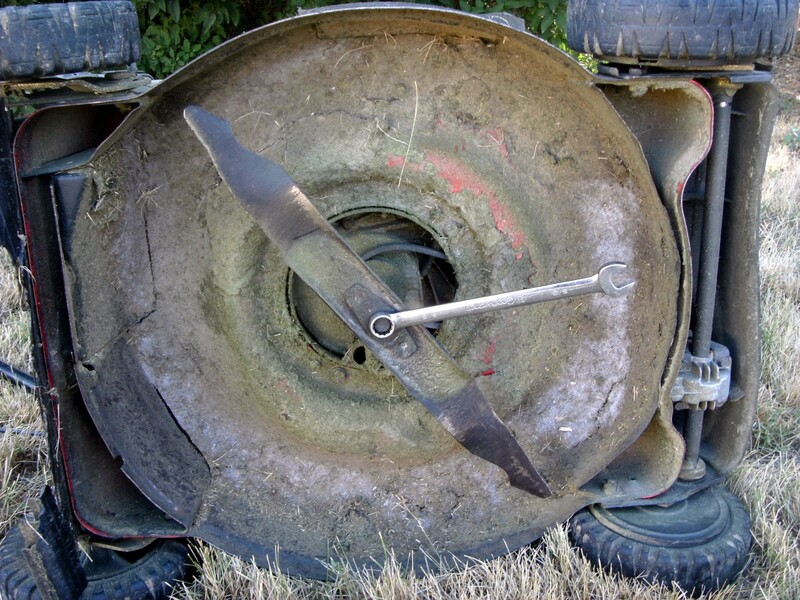 Make sure the lawn mower is sitting securely - you will be working underneath of it. The blade will have one or more bolts holding it in place, sometimes with a nut on one side of the blade. It may be possible to hold the blade with one hand (wear gloves - the blade may be sharp enough to cut) while using the wrench to remove the bolts with the other hand, but if not block the blade into place with a piece of wood to keep it from turning. Carefully remove the bolts, nuts, washers, plates or any other items holding the blade on, noting the order of assembly as well as which side of the blade goes up. 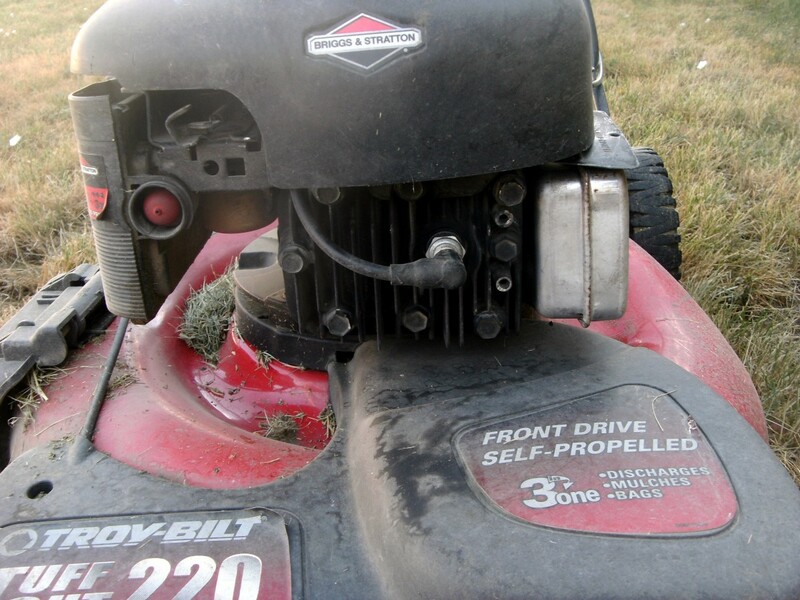 Remove the blade and check the shaft behind it - it probably has a blade support that will fall off of the engine shaft if the mower is returned to the upright position. It is a good idea at this point to stand the mower back up onto all four wheels. 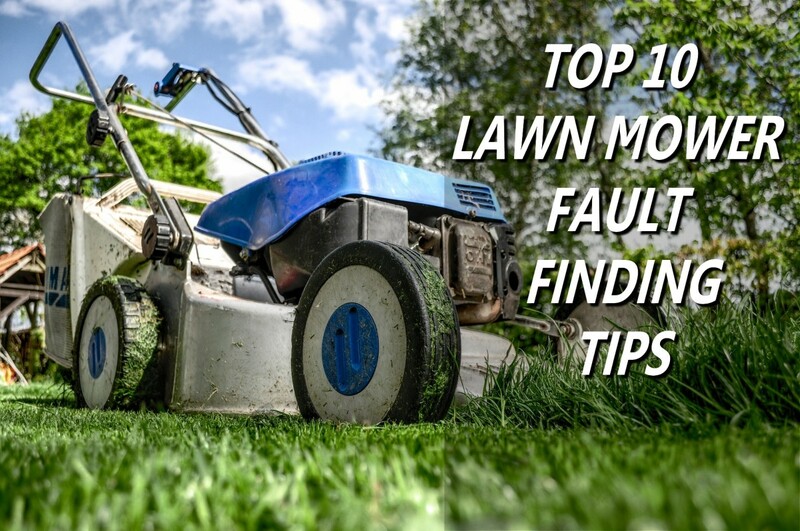 Motor oil can slowly drain into areas of the engine that can make it hard to start - leave the mower tipped over for as short a time as possible. 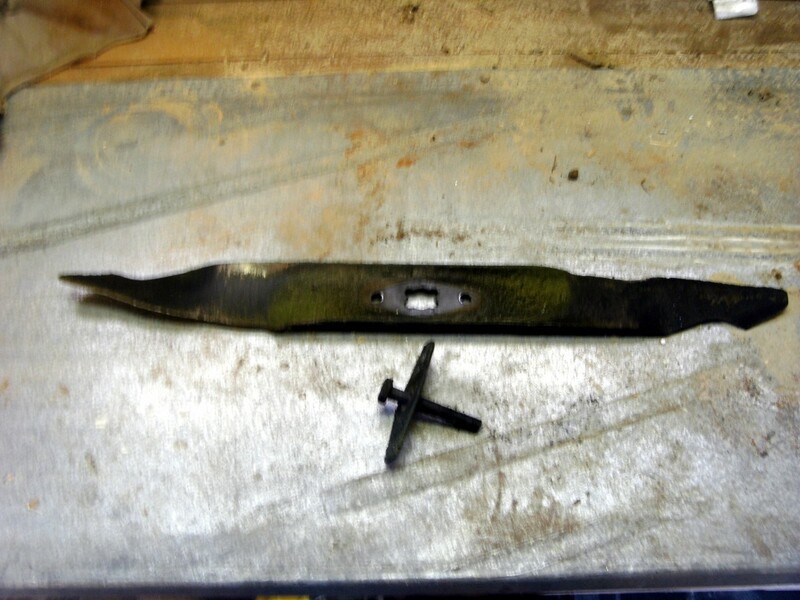 Sharpening a lawn mower blade can be accomplished with a variety of tools. A bench vise is very handy to have, but not absolutely necessary - clamping the blade to a workbench or to a board works nearly as well. A file will sharpen a blade, but takes a good deal of time and effort if the blade is exceptionally dull. If you use a file, be sure to keep the blade sharp by sharpening the blade several times a season. A better tool is a small angle grinder - these are not expensive and are very quick, but leave a rather coarse edge that should be filed by hand to smooth it out. Best of all is a bench grinder if one is available - between a file and an angle grinder in speed, but leaves a nice smooth job. 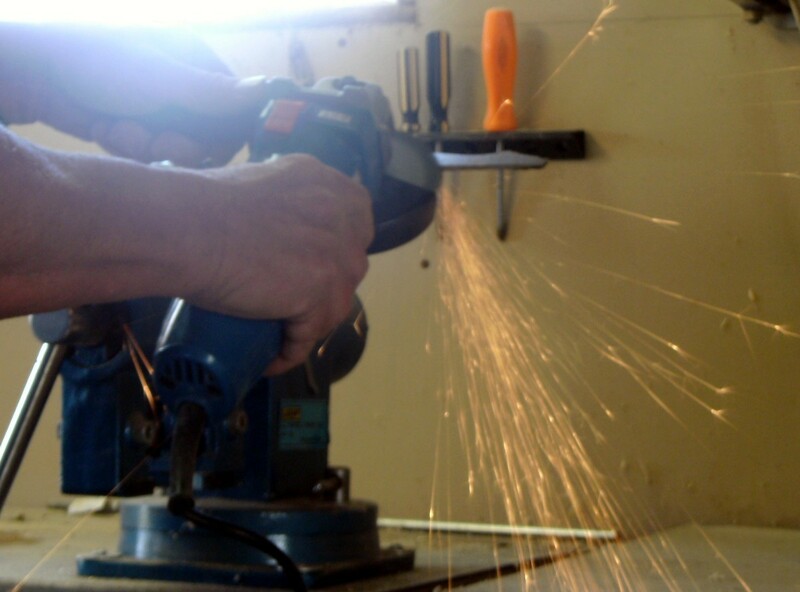 An angle grinder can be used on very dull or chipped blades, with the final sharpening accomplished with a bench grinder and is probably the best of all worlds. Make sure to wear safety glasses, particularly if a power grinder is to be used. Power grinders of any type will throw sparks (tiny pieces of hot metal) a considerable distance, and while they won't burn your skin they will surely injure an eye. Sharpen only the side of the blade with the angle on it; do not sharpen the flat side! Use the file or grinder at the same angle as the original cutting edge angle, making sure not to leave a power grinder in one spot for any length of time at all. 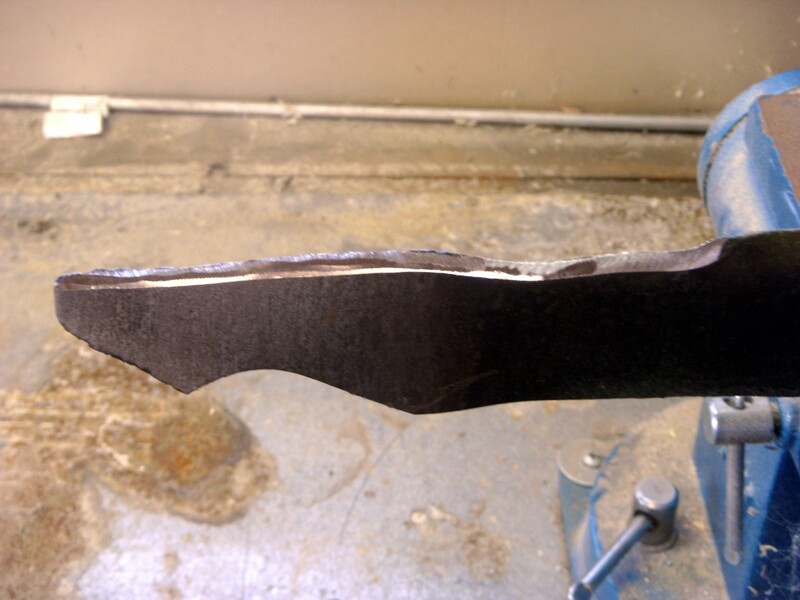 Continue to remove metal from the blade at the same cutting angle until most of the nick or chips have disappeared from the blade. One or two small nicks left in the blade won't hurt anything and attempts to make an absolutely perfect cutting edge can result in removing too much metal. Don't try to take a nick out by filing only that spot; file the entire cutting edge. Note that only the last few inches on each end of the blade have a cutting edge on one side and only sharpen that area that was originally sharp. When the blade is sharp and the nicks removed, smooth the area that has been sharpened as necessary and gently run a file across the back side of the blade to remove any burrs that the grinder as created there. This will dull the blade a tiny amount, so don't use a lot of pressure - just enough to get rid of the burrs and make the back side of the blade smooth at the cutting edge. Install the now sharp blade onto the mower, making sure the bolts are well tightened. Re-attach the spark plug wire, put some gas in it and you're ready to go! 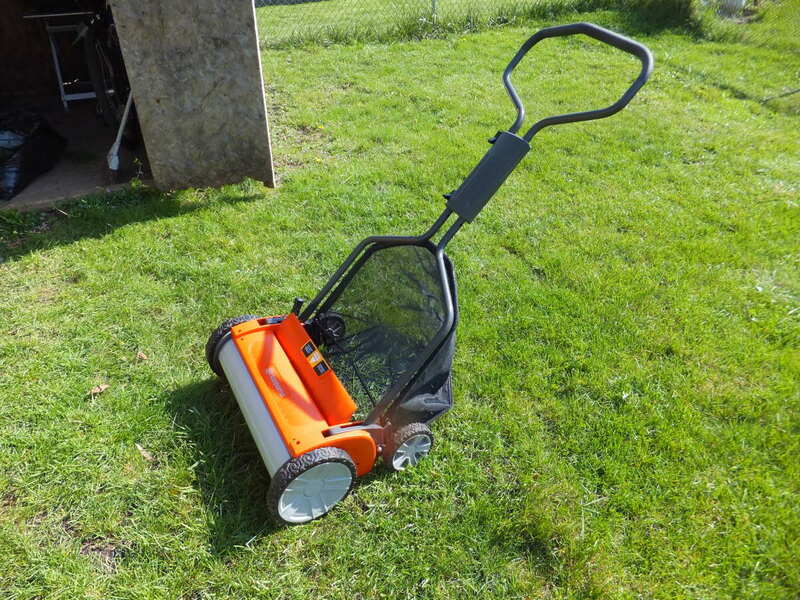 The whole job shouldn't take more than 20 or 30 minutes and is much easier than carrying a mower to someone else for the simple job of a lawn mower blade sharpening. If this task seems too large for your skill level, I suggest you take a look at this hub about learning to do your own home repairs. 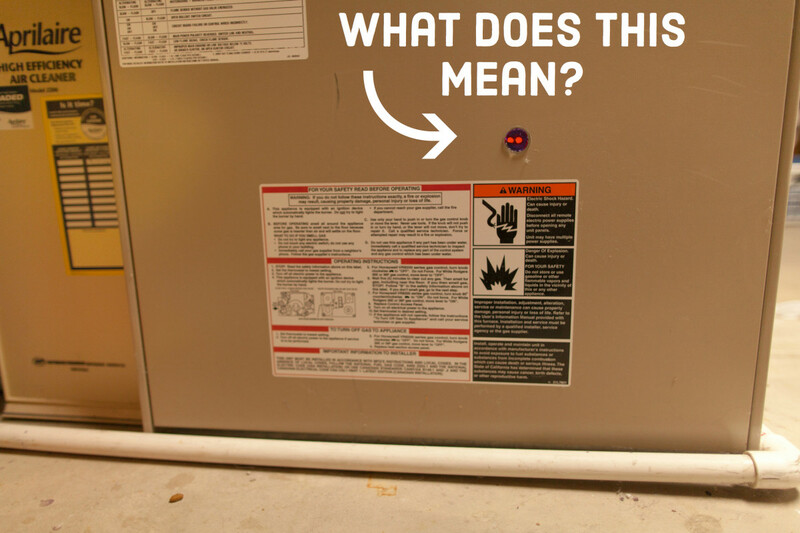 It is pertinent and may change your mind - this makes a good first experience for someone new to repairs. Also of possible interest for new homeowners needing their first tools is a suggested list of tools. Can I sharpen the blade on the mower if I'm using a hand file? It's just not smart to put your hands in the path of anything that could remove them from your body. While it is probably improbable that mower could start, it IS possible, and particularly so when it is an electric start. 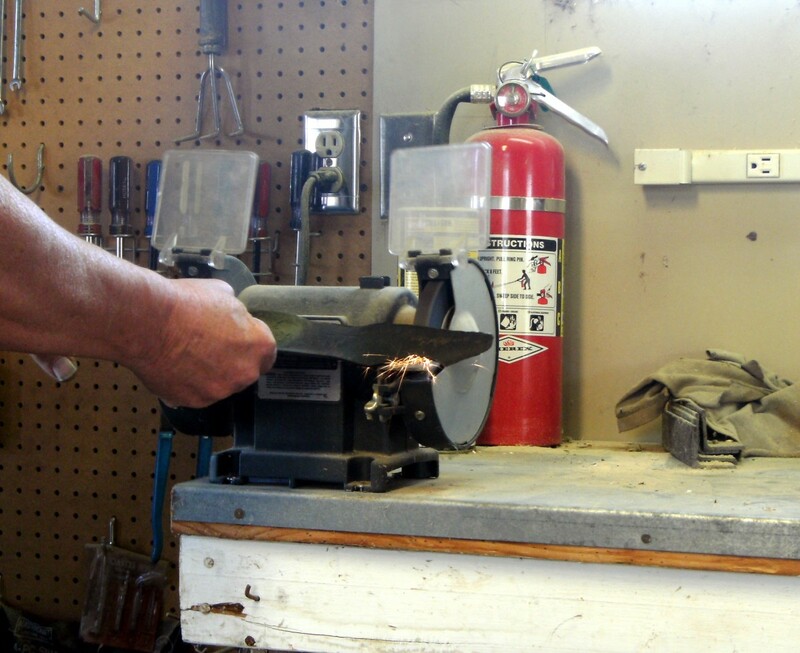 It takes only a few moments to remove that blade and work safely. You do not mention it but, there used to be, probably still is a blade balancing device. This device is a cone with a pointed stand. 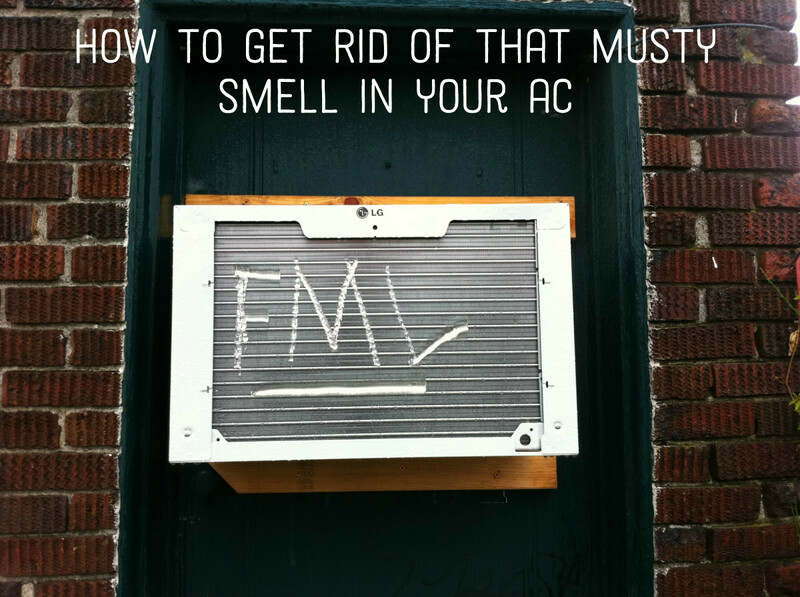 They are inexpensive, do a good job and last forever. eubug, I don't know why blades are sharpened on one side only, just that they are manufactured that way. Perhaps something to do with the air movement, picking the grass up to cut and blow it out? I usually use an angle grinder because the disks are inexpensive compared to wheels for a bench grinder. Also if the speed can be adjusted on the angle grinder, a lower speed prevents overheating and loss of temper of the steel. However if you are careful and don't allow the disk to rest at any one point for too long, it's not really an issue. I then usually finish off the sharpening with a hand sharpening stone. I always sharpen both sides of the edge of a blade so looks like I've been doing it all wrong! What's the theory behind only sharpening one side? 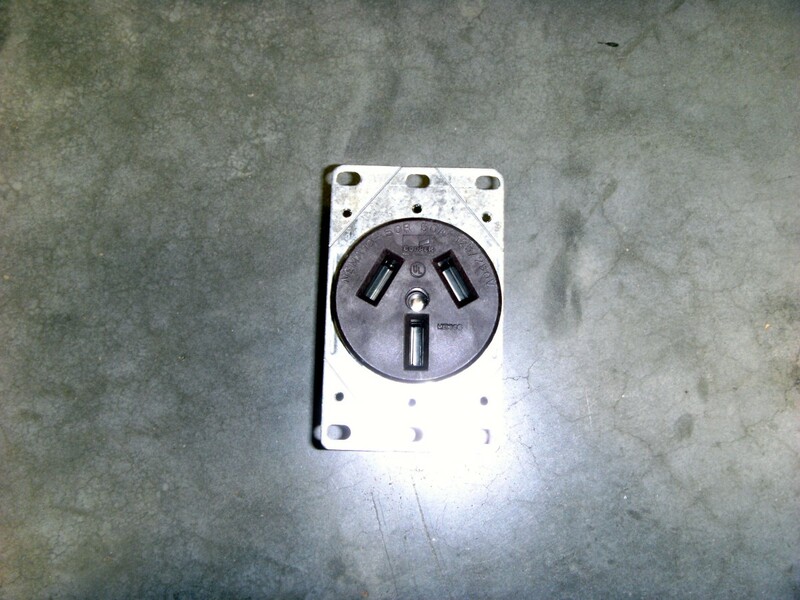 In answer to Albert Morton's question above, bolts which are used to hold on disks and blades on mowers, angle grinders, circular saws, miter saws, metal cutoff saws etc, always tighten in a direction counter to the direction of rotation so that they tend to tighten. Blades can be balanced by driving a nail into something so that it projects out horizontally (or clamp it into a vise as is done in the video) and set the hole in the center of the blade over the nail. The heavy end will drop, showing that a little more metal needs removed from that end. At $40 a pop, it's certainly cheaper to sharpen your own lawn mower blade and it is not difficult. How Ironic. I've been contemplating taking my blades off and sharpening rather than buying new ones before my first mow. I have a Cub Cadet 2166 with a 42 inch cut, (two 21 inch blades) and they're right at $40 for a new set! My only worry is that I won't grind them evenly and they'll be out of balance. I don't have one of those hub spinners to check the balance.